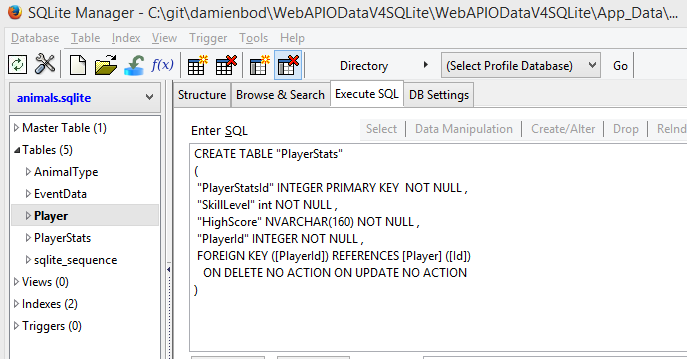 This post is part 6 of the Web API and OData V4 series. This article shows how Web API 2.2 with OData V4 can use contained EntityTypes in an OData model without defining the entities on the top level. In this example, the Player entity is the route entity set. The PlayerStats can then be accessed though it’s parent entity. i.e. The PlayerStats entity is contained in Player. I use SQLite Manager, but any SQLite Tool can be used. Now create the 2 entities in the application. The [Key, ForeignKey(“Player”)] needs to be defined for the Player in the PlayerStats. The entities have a one to one association and the direction needs to be defined. 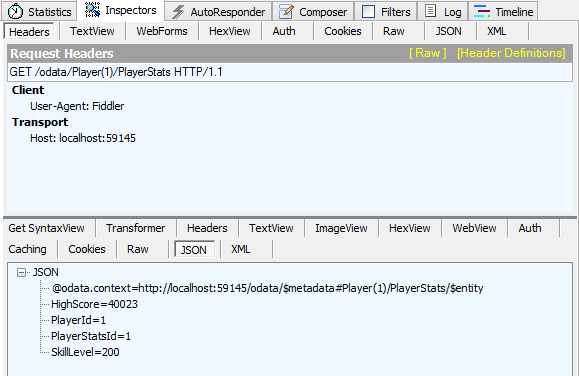 The PlayerStats property uses the OData Attribute Contained. This is required for the OData model. The Entites are ready to be used in the OData model. Add them to the odata model. Now an ODataController for Player can be created. This is the top level OData entity. The controller contains a method to access the contained PlayerStats (GetPlayserStats). This method returns the PlayerStats for it’s parent Player entity.